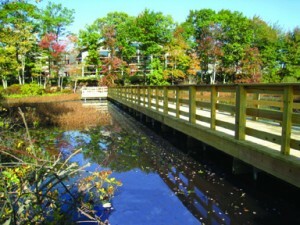 Solid Earth Technologies, Inc. was contracted to construct elevated boardwalks throughout a 3,200 foot bike and pedestrian path that ran through wetlands between a Middle School and Norwell High School. The project consisted of approximately 1,500 feet of 8 foot wide boardwalk in three separate sections with the support of AB Chance Helical Pier Foundation Systems. 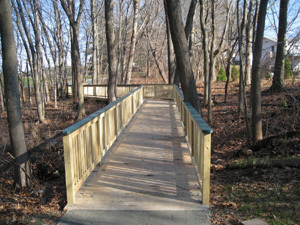 Solid Earth Technologies, Inc. constructed the 2300 foot long nature trail and river observatory. 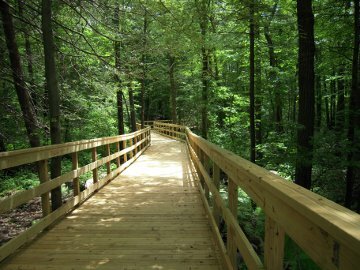 The trail has five separate elevated boardwalk sections which cross wetlands and swampy areas throughout its path as it begins and ends along the Ten Mile River. The boardwalks are supported by 170 helical piles installed using a combination of handheld equipment and a small excavator. 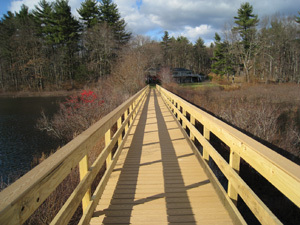 Solid Earth Technologies, Inc. constructed this 200 ft. long bridge over the cranberry bog behind the Bass Pro Shop at the Patriot Place. It is 8 feet wide and supported by 88 Helical Piers. Helical piles are very ideal in beach shorelines due to the sandy soils and marshes that make for unstable building conditions. 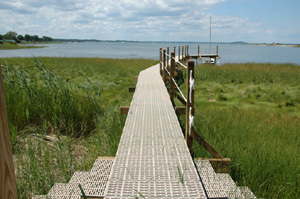 Solid Earth Technologies, Inc. has installed foundation piles for docks, boardwalks, decks and houses along the coast of New England as well as lake fronts.